As a group of Canadian importers, distributors and retailers recently discovered, the term “Italian design” is synonymous with the very finest in craftsmanship, style and quality. The companies participated in a Toronto workshop in mid-May that showcased the latest in Italian eyewear from producers new to Canada. A delegation of Italian designers and manufacturers representing eight companies attended the event, which was organized by the Italian Trade Commission in cooperation with the Italian Optical Goods Association (ANFAO). Swarovski was also featured in the Dario Martini collection presented by Martini Occhiali. The company distributes a wide range of metal eyewear for men, women and children in many different colours and its top product is an exclusive collection of women’s eyewear embellished with original Swarovski crystals. Milano6769, a brand of Eye Technologies Group, presented a collection of hand-made frames polished with natural waxes and featuring attractive temple designs. The collection consists of 10 models in four colours each. “Eye Technologies Group has partnered with Quebec-based DirectLab Network to develop the lens business in Italy and will soon have a company in Canada specializing in lenses and frames,” said Iazzolino. Trevi-Coliseum, the largest exhibitor, produces the Clark, Coliseum and Cotton Club lines. Their frames maintain handcrafted quality, combined with the latest technologies and exotic materials such as carbon fibre, wood, titanium and natural rubber. G.B. s.r.l. 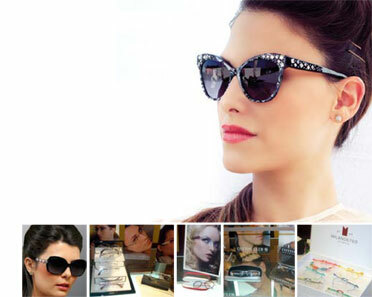 specializes primarily in metal eyewear and NIK03® is their top brand. A leader in stainless steel, nickel-free frames, G.B. emphasizes quality while working to protect “Made in Italy” production. Logoproject design employs cutting-edge designers who pay careful attention to materials and innovative manufacturing techniques in their eyewear collections. Logoproject is the exclusive worldwide licensee for Romeo Gigli eyewear, a wild, funky, colourful, and fun collection of frames and sunwear. Inspired by the latest fashion trends, Matinèe collections from Matinèe Maryla feature an original and unique style, with retro influences and contemporary flavours, in both material and design. Ali Khan, optician and CEO of the Academy of Ophthalmic Education, said he much preferred the Toronto event to “big” shows like Mido because he wasn’t obligated to purchase hundreds of frames that might end up collecting dust. He also noted that it was a great way for professionals to differentiate themselves from their competitors. Khan was very impressed with the quality of the products, notably the collection displayed by designer Lara D’Alpaos, an architect, who had has never distributed in Canada before. The design and materials of her Lara D. collection have been crafted to blend into a single element that embodies the concept of wearability. Organizers were pleased with the turnout of more than 200 visitors, including Mido Marketing Manager Francesco Gili. Congratulations go to Italian Trade Commissioner Pasquale Bova and his wonderful team for the success of the event. The Italian Trade Commission and ANFAO are already planning next year’s workshop, which is tentatively scheduled for Montreal in late May or early June. Stay tuned.